Some things don't change-like the answers to great questions about writing-but they do get updated! 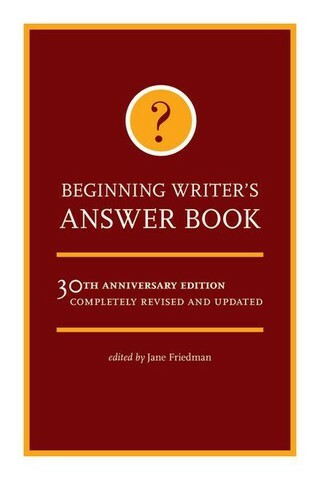 Now in the 30th anniversary completely revised and updated Beginning Writer's Answer Book, you'll be privy to solid writing advice that stands the test of time yet has been brought current by Writer's Digest Books editor Jane Friedman. Beginning Writer's Answer Book is for the writer just starting out, for the person who writes for a hobby and doesn't consider himself a real "writer," and the writer who's mastered one area and has questions about other genres or forms. At a hefty 432 pages, you'll find expert answers that will work for you no matter if you're penning prose, giving a nod to nonfiction, finding out what it takes to be a freelancer, and so much more. With a nod to the previous edition, you'll also be entertained with flashback questions that provide nostalgic amusement to how we approached writing "back in the day." Beginning Writer's Answer Book is divided into twenty-nine chapters, with useful appendices in the back. It's not meant to be read cover-to-cover-though you could if you have a voracious curiosity about all things writing. In Chapters 1 through 7, you'll find core knowledge for all writers such as everyday publishing jargon, understanding the markets and queries, how to format and submit your work, standard practices and more. Chapters 8 through 15 address book, magazine and freelance basics such as the essentials every novelist needs to know, selling nonfiction work, writing and selling articles, and starting a freelance career. In Chapters 16 through 22, you'll become familiar with copyright basics, understanding your rights, rules for quoting, seeking permission, providing photographs and art and if you should use a pen name. Chapters 23 through 29 move into the more highly specialized questions of writing poetry, children's books, scripts, songs, writing for newspapers, and self-publishing. Whether you write for business or pleasure, this is the book that provides the answers you need to know in order to be taken seriously in the writing world.